Prime Point Foundation, and ezine PreSense honour the top performing MPs with ‘Sansad Ratna Awards’ for the past four years, based on their participation in debates, raising questions, introduction of private member bills and attendance. The data is made available by PRS Legislative Research, New Delhi. This year the Foundation has added two more categories to include women MPs and young MPs less than 35 years of age. 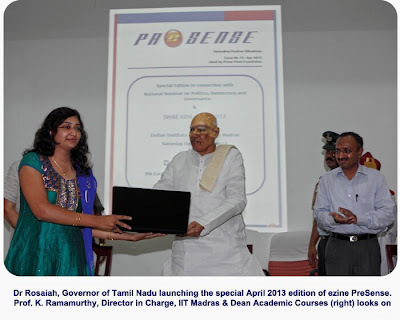 4th Annual Sansad Ratna Awards 2013 was held at IIT Madras on Saturday the 20th April 2013. A national seminar on politics, democracy and governance also was organised jointly with Department of Humanities and Social Sciences of IIT Madras. The purpose of the seminar and the Award is to create awareness among the people about the democracy and governance. The Foundation selected 5 MPs for overall performance tally, 4 top performers among women MPs and one young MP under 35 for the awards. Out of these MPs, six MPs received the awards at Chennai from Mr T S Krishna Murthy, Former Chief Election Commissioner of India in the presence of Dr K Rosaiah, His Excellency The Governor of Tamil Nadu. Others could not participate due to their preoccupation in their constituency. Mr Anandrao Adsul, Shiv Sena MP from Maharashtra was honoured for maintaining the top position in raising questions in the current 15th Lok Sabha. He has raised 1055 questions till the end of last sittings in March 2013 with a total participation tally of 1091 for debates, questions and private member bills. Mr Anandrao Adsul was the topper in raising questions even in the 14th Lok Sabha, by raising 1255 questions with a total participation tally of 1290. Mr S S Ramasubbu, Congress MP from Tamil Nadu secured the second position in the total performance tally of 1038 and maintains No 1 position among Tamilnadu MPs from the time the awards were instituted. Mr Arjun Ram Meghwal, BJP MP from Rajasthan received the Award for the second year for his outstanding performance in debates - by participating in 386 debates. His total tally is 1002. Mr Hansraj Gangaram Ahir, BJP MP from Maharashtra was honoured for being No 1 in the category ‘introduction of private member bills’ with a total participation tally of 996. He has introduced 31 Private Member Bills in this Lok Sabha. It may also be noted that Mr Hansraj Ahir and Mr Arjun Ram Meghwal have together introduced 51 private member bills, out of the 372 private member bills (14%) introduced in the current Lok Sabha by all the members. Mr Anandrao Adsul, Mr Ramasubbu and Mr Hansraj Gangaram Ahir received the Awards fourth time in a row. Among the top performing women MPs, though 4 women MPs were selected and invited, two MPs received the Awards at Chennai. These women MPs were honoured with ‘Sansad Mahila Ratna’ Award. Mrs Rama Devi, BJP MP from Bihar secured third position among all the women MPs in the Lok Sabha with her total score of 579. Dr Jhansi Botcha Lakshmi, Congress MP from Andhra Pradesh has topped in debates among women MPs by participating in 131 debates. Her total participation tally is 478. The purpose of such Award function is to recognize the top performers at national level and to motivate others to perform better. Prime Point Foundation is the only organization in India which honours the top performing MPs every year based on their performance. A National Seminar on politics, democracy and governance will be held to coincide with this Award function. Award winning MPs and other Tamilnadu political leaders will be participating in the panel discussion. Prime Point Foundation brought out a special edition of ezine (73rd edition) to coincide with this occassion bringing out various aspects of Parliament functions and the role of MPs. The ezine was launched by Dr K. Rosaiah, His Excellency The Governor of Tamil Nadu. The special edition may be downloaded from http://www.prpoint.com/ezine/presense0413.pdf. 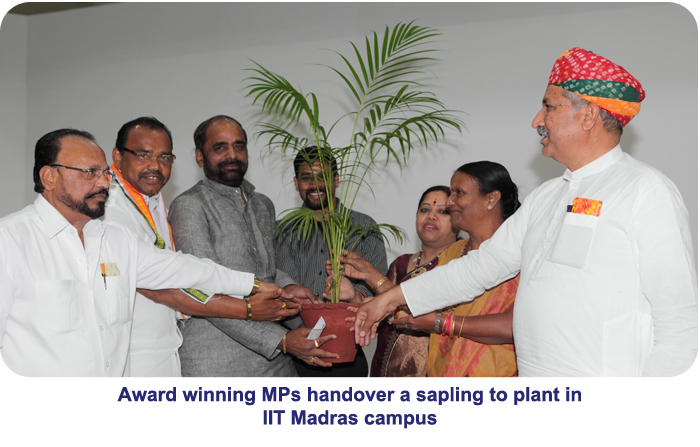 All the six Award Winning MPs handed over a sapling to K Abdul Gani, Convenor of Green Kalam initiative. The sapling was later on the same day planted inside the IIT Madras campus in honour of the top performing MPs. The purpose is to create an awareness about the environment protection. All the MPs assured that they would actively promote the environmental protection concept in their respective constituencies. We will post the details about the National Seminar on Politics, Democracy and Governance in our next posting.